Many types of processing equipment exist, each tailored to a unique purpose. High pressure homogenizer applications require the most efficient fluid processing equipment for particle and droplet size reduction and cell disruption. These unique applications are critical in a wide variety of applications. BEE International high pressure homogenizers produce the most advanced results in this area of processing equipment and are called upon where stringent requirements must be met and the most efficient process saves manufacturing time and money. Our high pressure homogenizers are designed to succeed with these applications. With BEE laboratory systems many process parameters can be modified to further improve results and reduce the number of passes required. 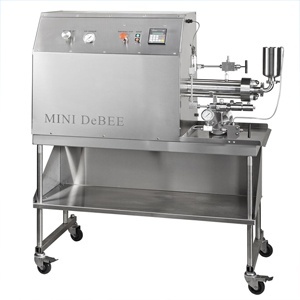 This is an in-line mixing technology, so the entire product batch receives the same level of processing. It is also a scalable technology so the results developed in the lab will scale up to manufacturing.